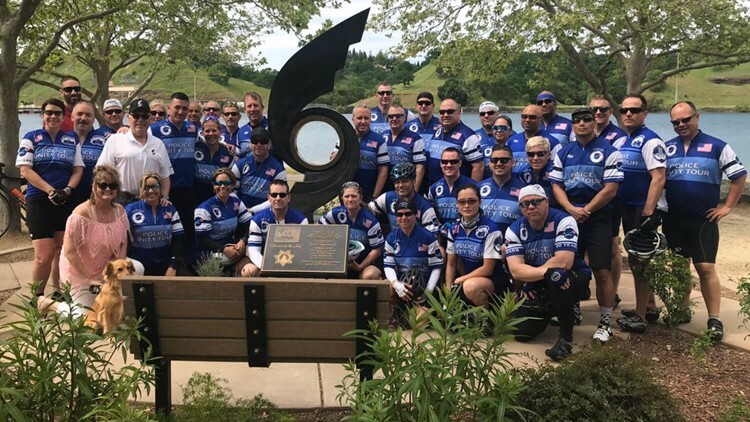 'Never forget' | NorCal officers prepare for 300 mile Police Unity Tour in Washington D.C. The 300 plus mile bike ride is meant to honor fallen law enforcement and help keep their memory alive. It will take place during National Police Week in Washington D.C.
SACRAMENTO, Calif. — As dozens of men and women prepare for a more than 300 mile bike ride, they know every pedal forward is practice for the real ride to remember fallen law enforcement and to honor the families of fallen officers across the country. On Sunday, the men and women of the Police Unity Tour - Northern California Chapter XIII held a practice ride as they prepared for the more than 300 mile Police Unity Tour, a bike ride spanning over four days in Washington D.C.
"This year, I'm riding for fallen officer Deputy Mark Stasyuk," said Brandon Gayman with the Sacramento County Sheriff's Department. "This will be my fifth year riding." Gayman is a detective with the sheriff's department, but he was also a friend to Stasyuk, who was killed in the line of duty in 2018. The two worked together at the Rancho Cordova Police Department. "This year will be the first ride where I'm actually riding for an officer who I knew very well, but that's emotional... I'm proud to be part of an organization like this that allows us to continue their memory," Gayman said. Many of these riders say they are part of the tour because of their own personal hero, and, as such, their northern California chapter continues to grow. "I've been doing this for 8 years, and I did this as a healing experience to begin with," said Crystal Mitchell, whose husband, Jeff Mitchell, was killed in the line of duty in 2006. His case remains unsolved to this day. "It's incredibly gratifying, and it really does fill a void that can't otherwise be filled," Mitchell said. "There's a missing piece of me always and being a part of this fills that void, [and] fills that piece of me just a little bit. Thankfully, I have these men and women to do this with me." On Sunday, the team completed a long practice ride which included a stop at the STAR VI memorial at Lake Natoma. 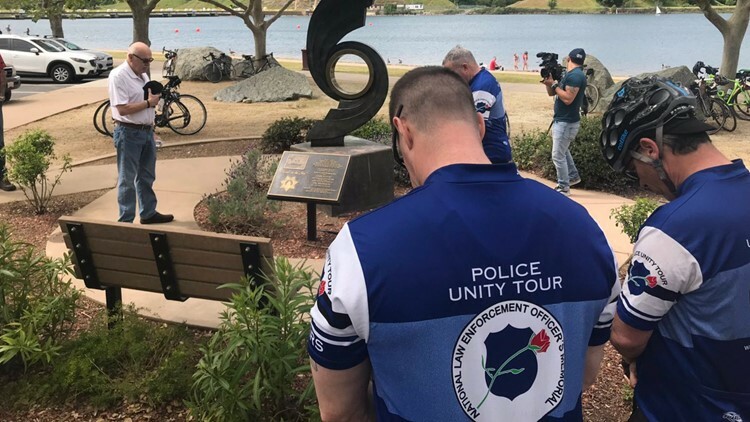 Dozens of men and women will honor fallen law enforcement by participating in a more than 300 mile bike ride known as the Police Unity Tour. On July 13, 2005, Sacramento County Sheriff's helicopter STAR VI, crashed. The crew — Pilot Joe Kievernagel and Tactical Flight Officer Kevin Blount — died in the crash, and the third passenger, Tactical Flight Officer prospect Erik Henrikson, was severely injured. "The circle there represents the tail rotor on the helicopter. You can look right across the lake and see the exact location of the crash," said Tom Blount, Kevin's father. "I know Kevin will never be forgotten. Kevin wanted to be a cop ever since he was 6 years old," Blount said to the group of riders. "He fulfilled his life long dream. I know Kevin died doing what he loved doing. He was a good cop and a good son." After a moment of silence for his son, Kevin, Blount shared what goes through his mind visiting this memorial. Dozens of men and women will honor fallen law enforcement in a 300 mile bike ride known as the Police Unity Tour. "Actually, he was more than my son. He was my buddy. We went everywhere together. I thought how many fathers are that lucky to have a son like that," he added. "He was so special. More than my son, he was my buddy"
It's important for these riders, to honor their friends, their fallen family members, and their "buddies." "We ride with a great group of people who are passionate about this job and passionate about the communities they serve, so it's special and it compounds those feelings and brings sense of camaraderie for the job and the communities we serve," Gayman said. To learn more about the Police Unity Tour, click here. Follow the conversation on Facebook with Madison. Officers each wearing at least 25 pounds of gear will run a half marathon holding a thin blue line flag to honor the more than 120 officers across the country who lost their lives in 2018.